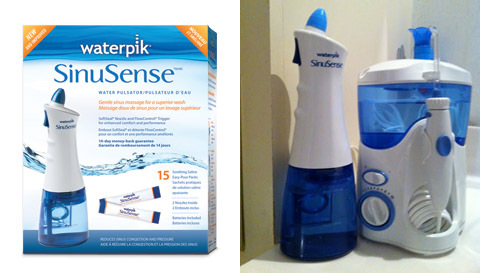 Waterpik Ultra WaterFlosser & SinuSense for Spring Allergies - Fueled by chile, frijoles & tortillas. The other day this came in the mail! 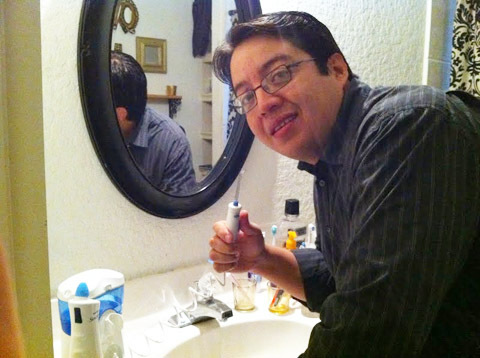 It was the Waterpik® Ultra WaterFlosser, and me and Anjelica were ecstatic! Well, to be honest, Anjelica was a lot more ecstatic than I was. 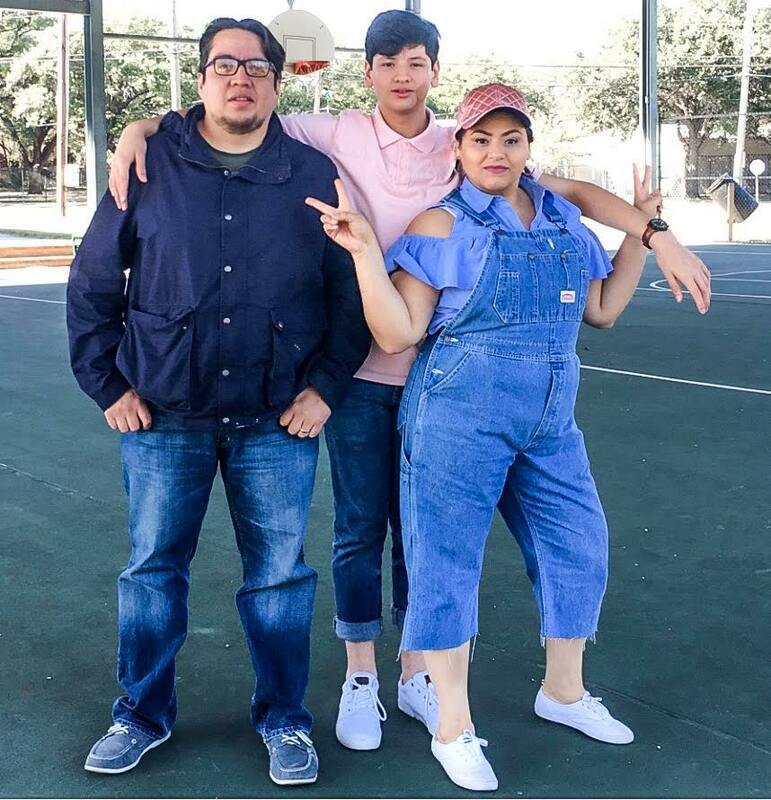 As it turns out, she had been eyeing one of these babies for months – sin yo darme cuenta of course. I, on the other hand, hadn’t even heard too much about it. Digo, besides the commercials on the television that every once in while grabbed my attention. But now that it was in front of me I was definitely intrigued. Flossing with water?! What’s that about? So of course I immediately opened the package and made my way to the restroom to test it out. Now, I’ve always been very particular about getting food stuck in between my teeth. I can’t stand it and because of that I always carry toothpicks in my truck… so this seemed like it could really be an improvement. As soon as I turned it on and started using it, my mouth felt like it was being washed out in places my toothpick could never fit. Score! Using the Waterpik® Ultra WaterFlosser did take some getting used to at first, I’ll admit, but once I got the hang of it, the sensation was even a little refreshing. I especially loved the dial on the front which let me control how much water pressure was coming out of the WaterFlosser. This is as visual as our exhibit is getting today. 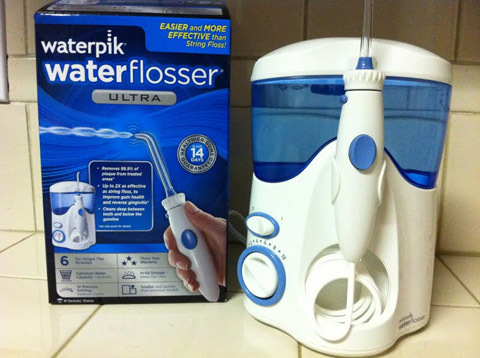 According to Waterpik®, the Ultra Water Flosser is the easy and more effective way to floss. It’s also the only brand clinically proven to be more effective than traditional dental floss for reducing plaque, gingivitis, and gum disease. All positive things in my book! Find coupons for this product and other great savings at Waterpik® website. Also in the mail was was this little gadget! 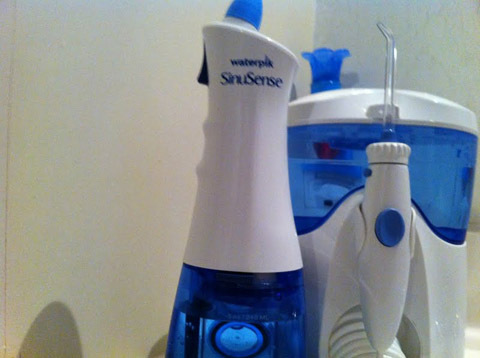 The Waterpik® SinuSense Water Pulsator for Spring Allergies. I’ve never actually suffered from allergies myself, at least not serious ones or ones that I am aware of, but every morning when I wake up my nostrils always feel a little stuffed up. Not that you ever wanted to know that about me, LOL! Well now you do. So I wanted to see if this product, which basically uses water to massage, cleanse and moisten your sinus passages, would be able to help me. It’s battery operated and came with a bunch of saline easy-pour packs that make the process that much more effective. Don’t worry, there aren’t any pictures of the Waterpik® SinuSense Water Pulsator in my nose coming up! I wouldn’t do that to you all. As it turns out, the water pulsator really did the trick for me. The last couple of days after using it in the morning before leaving the house, my nose hasn’t felt stuffed up at all. It’s kind of weird! Though the only thing I haven’t gotten used to yet is spraying water up my nostrils, jajaja! The first time I could have sworn I had just swallowed a bunch of water. This morning, the sensation was a little less abrasive. Thank goodness for that! The other thing that’s pretty cool is that the Waterpik® SinuSense Water Pulsator is dishwasher and microwave safe. Out and ready for their first use! And guess what? If you’d like to try this product out as well, you can find coupons and great savings from Waterpik® Here. This post has been compensated as part of a sponsored review by Waterpik®. I was not required to write a positive review. All opinions are my own #Waterpik. Juan, the water flosser looks interesting. Is it supposed to be used instead of traditional floss or as an adjunct. How long does it take to do? Hi Ezzy, thanks for the feedback! Yes, actually it is supposed to be used in place of regular floss because it is a lot less messy and to be honest, for me, much easier to setup. Using it takes all of a couple of minutes and is pretty painless.